Editor’s note: This article was written through a collaboration between C. Daniel Motley and the AoM Team. Matthew Arnold, a Victorian poet, once claimed, “The crown of literature is poetry,” and if our neglect of poetry is any indication, the crown is rusting. While books sales fluctuate from year to year, fewer and fewer publishing houses are printing volumes of poetry. The demand for poets and their poems has ebbed. However, we do ourselves a great disservice when we neglect the reading of poetry. John Adams, one of the founding fathers of the United States, commended poetry to his son John Quincy. Both Abraham Lincoln and Theodore Roosevelt committed their favorite poems to memory. Ancient kings were expected to produce poetry while also being versed in warfare and statecraft. That poetry has fallen out of favor among men in the 21st century is a recent trend rather than the norm. 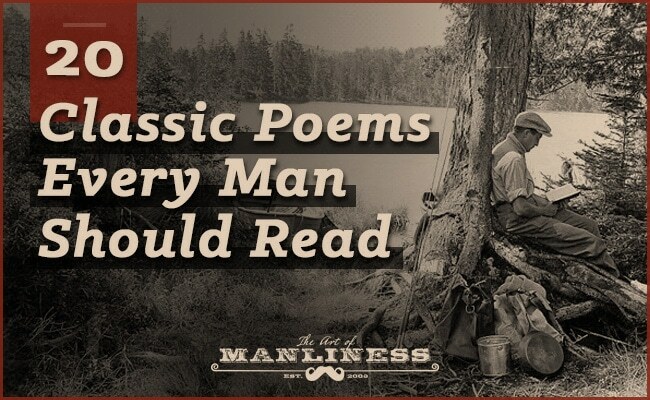 To help remedy this, we have compiled a list of 20 classic poems that every man should read. Spanning the past two thousand years, the poems on this list represent some of the best works of poetry ever composed. But don’t worry—they were selected for both their brevity and ease of application. Some are about striving to overcome, others about romantic love, and still others about patriotism. Whether you’ve been reading poetry for years or haven’t read a single line since high school, these poems are sure to inspire and delight you.